Komodo National Park has great things to discover above and underwater! 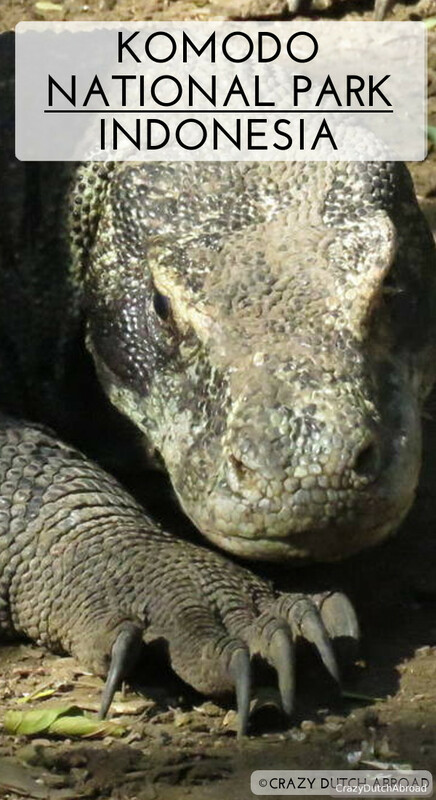 Komodo is called the land of the dragon, referring to the Komodo Dragon (Varanus komodoensis). These living fossils can get about 3 meters long. They are only 'available' on Rinca and Komodo Island in the Komodo National Park where they roam free. Since you simply can not go to Komodo without seeing the Komodo dragons I started checking tours and packages in Labuan Bajo, the town on Flores closest to the Komodo National Park. Rinca Island is about two hours by 'slow' boat from Labuan Bajo and the closest place to observe the. The tour agents in Labuan Bajo said the best place to spot the dragons is on Rinca, not sure if it meant the best for their sales or us seeing the most dragons. The average price in town is 350.000 Rupiah for one person for a full day shared trip and 1.600.000 for a private trip (without bargaining). After having paid for too many tourist traps we wanted to create our own half day tour and start in the afternoon. To be honest, after diving in the area I could not be bothered going snorkeling in the areas that are less spectacular but 'en-route' making it a 3/4/5-in-one tight scheduled day trip. But, on the other hand, paying for a private trip was out of our budget as well. So, after bargaining with local fisherman outside of town we got a deal for a private boat for four people for 800.000 Rupiah. Once we saw the boat the next day, we realized a booked tour might have been a better idea. It was a small fishing boat with a wooded floor and an impressively loud shaking engine. On our way over we got hold-up a few times due to propeller maintenance and sailing over garbage and pieces of wood floating around. Once the captain even jumped in the water and changed the propeller after hitting something. The amount of garbage floating around in the area is horrible, everywhere. Many beaches around Labuan Bajo are covered with a layer of waste like drinking bottles, plastic bags and wrappings. Entering the Komodo National Park. Once arrived on the island after two long noise hours the UNESCO World Heritage site looked like an empty theme park, and the prices were a bit similar. We had to pay (per person): 150.000 Rupiah National Park Fee, 50.000 to enter the Komodo Dragon park, 20.000 for a guide, 10.000 to observe the wildlife and 5.000 to hike in the park. Four people paid a total of 940.000 Rupiah, 70 US dollars. I hope that either we got fooled and the guys had a good day or even better, all the money really goes to the protection and care for the dragons in this park and maybe some education about water waste management. We took the short track since it was hot & sunny and probably not a lot of shade, plus most of the dragons would be in that area. It took us about 30 minutes and basically all the dragons we have seen were laying around the parks headquarters. The walk was nice, not a hike, and there was a nice view over the bay. Our guide was explaining many interesting things about the dragons, most of our questions were answered and with his Y-shaped walking stick he could chase the dragons away in case they got aggressive. They can run as fast as 20 KM per hour, so do not run. Komodo Dragons on Rinca Island, Komodo National Park. How many dragons can you see? None of the tour agent was telling us this. Of course, they walk free and you can be really lucky or the other way around - guaranties. We counted about 30 dragons, only 2 young ones were actually moving / walking. Was it worth it? Well, I am not a biologist and I am not so much into tourist activities (as mentioned before), but the animals are really impressive. Even though they lay down flat and barely moved, we were really glad that we did it, even-though I would have preferred a combined trip with 2 SCUBA dives from Labuan Bajo or as part of a SCUBA liveaboard. Labuan Bajo is a harbor town on Flores. It gives direct access to Komodo National Park for world class SCUBA diving and to observe the Komodo Dragons. Find out what else you can do in this area, where to eat & drink and information about accommodation in this area. Click here to read about Flores! Let me know if my travel information and tips are useful to you! Please leave your comment below!